OK, back to Chicago style before I drive you batty. Former Vermont poet laureate Ellen Bryant Voigt’s eighth collection of poems, Headwaters, is marked by both decadence and restraint. She embraces the former quality when she brazenly flushes quotidian signals to the reader (punctuation, capitalization) down the drain. The solitude she evokes in “Fox,” the reader soon understands, has become the poet’s aquifer, the headwaters of her verse. Voigt writes, “it is my toy,” which she uses to play with themes of nature, rural life and family. Another of her concerns, one suspects, is the act of thinking and thought itself, with a preference for the fluid nature of intuition over the flinty terrain of knowledge. Another delightful aspect of this collection is the experience of finding some topic of a given poem picked up and developed in the next. To match the poet’s watery theme, one might say ideas are bucket brigaded through the collection. For instance, the reader discovers a mother at the very end of “Oak” who shows up in the next poem, “My Mother.” Her swooping around her “stubborn broody child” anticipates the next poem, “Owl,” which introduces the child’s father as he “took the key from under the eave // and unlocked the door to the darkened house he had grown up in.” The current of the poetry flows back upstream, as now “the farsighted owl strikes in utter silence…” It flows forward again in the next poem, “Milkmaid,” which returns to the father and his “usual bitter thermos his usual two sandwiches / one butter sliced in a slab the peasant’s cheese one meat / maybe headcheese the leftover parts of pig…” Care to guess which aspect the next consecutive poem, “Yearling,” pursues? 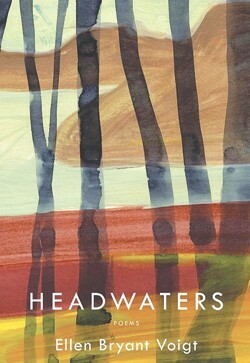 Cumulatively, the poems in Headwaters form a water park of words, offering readers a sophisticatedly engineered collection and a safe yet exhilarating ride. Sloshing from one idea, memory or observation to the unexpected next one — without those meddlesome little stop-and-go punctuation marks — this reader feels like she is riding the breaking waters of the poet’s artesian mind. The original print version of this article was headlined "Go With the Flow"